I've been all over Twitter for any bit of news about the trade deadline, specifically the Yankees pursuit of Sonny Gray. While I'd like the Yankees to acquire any good starter to shore up their rotation for a postseason run, Gray would be a top 2 or 3 starter not only this season, but for a couple more years as well. However, my longing for them to deal for Gray came when the package being discussed for him included Jorge Mateo, Estevan Florial, and Domingo Acevedo. As I wrote in a comment to a post from Daniel, I'm okay with this deal as I don't see those three players as being a big part of the team's future. Mateo and Florial, along with another top prospect in Dustin Fowler (he should be ready to play by Spring Training), are battling for one outfield spot thanks to Clint Frazier and Aaron Judge being locks out there already. And that's assuming the Yankees somehow rid themselves of Jacoby Ellsbury (I don't really buy that he'll be a $21 million bench player), don't sign Bryce Harper next off-season (I really want Harper, and why wouldn't anyone else? ), and all they also wait for Brett Gardner's contract to expire or for him to be traded. To be fair, Acevedo could be a part of the Yankees rotation soon. He's only had two starts in AAA, so I expect him to begin next season in Scranton before getting called up sometime during 2018. And with the rotation having two or three openings heading into next season, Acevedo may get a shot sooner rather than later. But Sonny Gray could hold a rotation spot among the top two or three for the next two seasons behind this one. And having already had a ton of success in MLB, I'd put him above any minor leaguer on the planet, not just Domingo. You may say that Ace could be a rotation part for six years, as opposed to Gray's two, and you'd be absolutely right. But keep in mind the Yankees would still have a great farm system even if they dealt away those three above, meaning they could trade for another top starter in the next couple of years. And the after the Yankees get under the Luxury Tax threshold next season (they'd have to spend big this offseason not to, and I don't see that happening or even necessary anyway), they could sign possible free agents like Clayton Kershaw or Dallas Keuchel. Or what about other pitching prospects like Justus Sheffield, Albert Abreu, and Chance Adams? 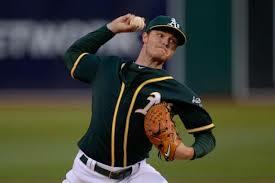 Now, there was something that came out last night that gave me big pause on trading for Sonny Gray. And that's Oakland's apparent desire for either Clint Frazier or Gleyber Torres to headline the package. Those two players have obvious spots for the future, and there's plenty of reason to believe they will be key members of the Yankees for a long time. Those type of players should not be traded away, which is why Brian Cashman has said those two are off limits. If the Athletics will do Mateo, Florial, and Acevedo then deal should be made. Otherwise, do what Daniel mentioned and look at another pitcher such as Dan Straily. My fear about Acevedo is that he could turn out to be Michael Pineda, Jr. I have no problem including him in a deal for Gray. I think highly enough of Adams, Sheffield, and, health-permitting, Kaprielian to know that they are the arms of the future. I absolutely would not want to see Torres or Red Thunder included in a deal for Gray. I think a package headlined by Jorge Mateo and Estevan Florial is incredibly fair. Yankees would be foolish to move Frazier or Torres for Gray. If Acevedo is as good as you think he might become then hold onto him also. Pitching is what Yankees will need both this year and for the future so why trade a promising prospect for Gray who has history of injury. If A's won't budge then move on it would not be the end of the world for Yankees. I have been going to some places and watching some of the farm boys play. "Ace" showed me that if the Yankees have no spot for him as a starter next year...putting him in the BP (just to have a chance to get his feet wet) is not the worse place for him to show just how good he can be. As a BP guy he would make a great book-end with Dellin. Chance and "Ace" two of the better pitchers we have down on the farm. They are not going to come up and just be un-hittable but, they can become very good, maybe, even front liners...with time. I've already seen Ace called the right-handed Aroldis Chapman this season by scouts and bloggers. That's exciting to me. I should have spent more time reading other blogs, I would have known that without seeing it myself. The guy can become a #2 or #1, depending on how many pitches he can count on...I'll settle for 3 workable pitches. Chance is more of a pitcher than "Ace", but who knows what they will turn out to be...#1 & 2 for the next 10 years? Could we have Sonny Gray, Severino, "Monty", Chance and "Ace" as our starting Five in 2018?